The former U.S. ambassador to the U.N. said he has no doubt that Syria had a hand in ex-Premier Rafik Hariri's assassination adding that the issue became international after clear proof of Syrian involvement in the Feb. 2005 bombing. I have "no doubt of Syria's involvement" in Hariri's killing, John Bolton told pan-Arab daily Asharq al-Awsat in remarks published Wednesday. "I believe that everyone not just in Washington but also in Europe and all those who understand Middle East affairs believed that Syria was involved," Bolton said. The issue became international because of "clear proof of Syrian involvement." 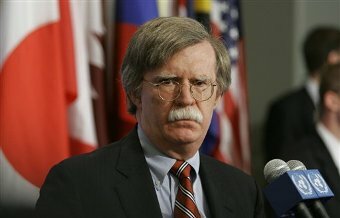 "I don't think that the investigators have any doubt" regarding Syria's involvement in the assassination, Bolton said. He said Washington backed an international investigation into the assassination at the time because of "Syrian penetration of security services and the judicial system in Lebanon." "The Lebanese alone are not capable of conducting a full and impartial investigation," Bolton said, adding that for this reason Washington looked for a way to help the Lebanese and the "democratically elected government of Premier (Fouad) Saniora." He said the international tribunal's main message is directed towards Syria and Iran. "We know what they (Syria and Iran) were trying to do in Lebanon. The tribunal is an effort to prevent that from happening because if people understood that Syria was behind Hariri's assassination, this would definitely hamper efforts for their return to Lebanon," Bolton told Asharq al-Awsat. He said Hariri's murder along with other attacks on political and media figures in Lebanon was aimed at destroying Lebanon's independence and sovereignty. Bolton told his interviewer that Washington had backed efforts to expand the probe into Hariri's assassination to include the other killings because it looked like there was a "pattern" in the murders. He stressed that the U.S. won't put pressure on the tribunal which would function independently and the judges will reach their own verdicts.